Gina knows what she’s done isn’t right, but she’s trying to justify her actions—falling in love with a married man, leaving her own husband, separating her lover from his daughter, Evie. In the preface, she describes the day that Evie saw Gina and Seán sneaking a kiss at a party. Evie “laughed and flapped her hands.” There’s sense of approval in the description, and if Evie feels glee about the relationship, surely it’s okay. For Gina, this squeal is a seal making her relationship with Seán official. 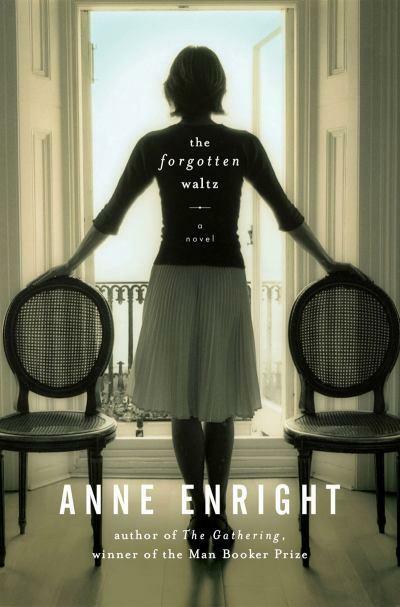 In The Forgotten Waltz by Anne Enright, Gina tells the story of her relationship with Seán, the man she considers the love of her life. They met at her sister’s housewarming party but only became involved after they started seeing each other regularly through their work. Gina doesn’t seem to like Seán much, but she can’t stop noticing him and thinking about him. She says that it’s love, that she can’t help herself. And circumstances do perhaps push them together, especially after the relationship is discovered and the economic downturn prevents them from building new lives independent of each other. But is this an excuse, another piece of Gina’s exercise in self-justification? As a reader, I was at times nearly taken in by Gina’s story. Her present-tense narration puts readers right in the moment, seeing what she sees and feeling what she feels. The beautiful prose woos the reader, just as Seán beguiled Gina. But whenever her present-day situation intrudes, it’s hard to see how she could be on the right path. She and Seán are together, but the passion is gone. Gina talks about how much she loves him, but it felt to me like she was trying to convince herself. We learn little about his personality, other than that he’s distant and self-absorbed, except when it comes to his daughter. And how devoted to his daughter is he really? Gina says he is, but she also notes that he’s always telling her to go away. The more you examine Gina’s story, the more it falls apart. Gina is unreliable, and she’s deceiving herself more than anyone else. Gina’s excuses and explanations might not hold up to the cold light of rationality, but The Forgotten Waltz is not about rationality. It’s about that experience of being swept up in events you can’t explain or justify. It’s something anyone can relate to, even if we’d all like to think our decisions make sense. Gina is trying to make sense of things after the fact, when it’s too late to change course, after hearts have been broken and relationships severed. Late in the book, Gina describes that kiss that Evie witnessed in more detail. We learn that Gina and Seán played it off as part of a game and not a romantic kiss at all. Gina wants it to mean something, but it’s only in hindsight that a potential meaning emerges. In the moment, it’s nothing much, but in hindsight, Gina can find the significance that she craves; she can make her tawdry affair into an fated romance, blessed by an innocent child. She can tell us that such a love conquers all, but we don’t have to believe it. This entry was posted in Fiction and tagged BEA Review Copy. Bookmark the permalink. I’ve been anxious to get my hands on a copy of this one. Someone (??) mentioned it was a favorite book of 2011. Loved your review. I haven’t seen it on any favorite lists yet (and I’m not sure it’ll end up on mine), but I did see a lot of good reviews. It’s definitely worth reading. I can’t believe I haven’t read this one yet! I was so excited for it to come out, then I failed to make time for it. Perhaps I’ll pick it up in the next few days! That happens to me all the time! I get so excited, and then I get distracted by the next new thing. I really liked the writing in The Gathering. This sounds like just my kind of thing. Perhaps I’ll put it on my list! I’d be really interested to see what you think of this, Jenny. I think you’d like it. I definitely wan to read this one. I really enjoyed The Gathering by Enright and the quiet, contemplative read that it was. This has been on my list for a few months and I want to read it even more after reading your review! I had no desire at all to read The Gathering, but this one I find very intriguing. I think there’s such a powerful truth at work in the recognition that so much of people’s emotional life is a mystery to them, and that triumph and disaster are often indistinguishable. Thank you for the excellent review.